SECTOR: [PASS] GrandVision is neither a technology nor financial Company, and therefore this methodology is applicable. SALES: [PASS] The investor must select companies of "adequate size". This includes companies with annual sales greater than €260 million. GrandVision's sales of €3,205 million, based on 2015 sales, passes this test. CURRENT RATIO: [FAIL] The current ratio must be greater than or equal to 2. Companies that meet this criterion are typically financially secure and defensive. GrandVision's current ratio €637m/€830m of 0.8 fails the test. LONG-TERM DEBT IN RELATION TO NET CURRENT ASSETS: [FAIL] For industrial companies, long-term debt must not exceed net current assets (current assets minus current liabilities). Companies that do not meet this criterion lack the financial stability that this methodology likes to see. The long-term debt for GrandVision is €1 billion, while the net current assets are - €193 million. GrandVision fails this test. LONG-TERM EPS GROWTH: [PASS] Companies must increase their EPS by at least 30% over a ten-year period and EPS must not have been negative for any year within the last 5 years. Companies with this type of growth tend to be financially secure and have proven themselves over time. GrandVision's EPS have increased by 128% in the last 4 years, GrandVision passes this test. Earnings Yield: [FAIL] The Earnings/Price (inverse P/E) %, based on the lesser of the current Earnings Yield or the Yield using average earnings over the last 3 fiscal years, must be "acceptable", which this methodology states is greater than 6,5%. Stocks with higher earnings yields are more defensive by nature. GrandVision's E/P of 4% (using this year's earnings) fails this test. Graham Number value: [FAIL] The Price/Book ratio must also be reasonable. That is the Graham number value must be greater than the market price. GrandVision has a Graham number of √(22,5 x €0,8 EPS x €3,70 Book Value) = €8,4 and fails this test. Dividend: €0,3/€25 = 1% but growing: For the years 2016 and beyond, GrandVision intends to pay an ordinary dividend annually in line with the Company’s medium to long-term financial performance and targets in order to increase dividend-per-share over time. The Company envisages that, as a result of this policy, the ordinary dividend payout ratio will range between 25 and 50%. 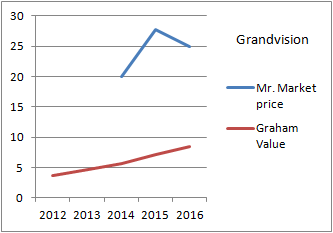 Conclusion: GrandVision seems to be a great company with Return on Equity over 25% per year and growing sales and earnings per share, but it is not for the Graham Defensive investor. Buy under €20 ?